History: Owned by Jim and Donna Pacheco of Pacheco Family Dairy. Established in 1955 in Bodega Bay then relocated to Petaluma in 1969 by Jim's father. Made first cheese in 2001. History: Dairyman Bob Giacomini began milking cows at his Point Reyes dairy in 1959. With the help of his wife and four daughters, they began producing blue cheese in 2000 on the family ranch. History: The Barinaga family has been sheep-ranching in America for more than a century. Cheesemaker Marcia Barinaga left a career as a science reporter to pursue cheesemaking when she and her husband, Corey Goodman, moved to Marshall. History: Joel and Carleen Weirauch began making cheese commercially last year. 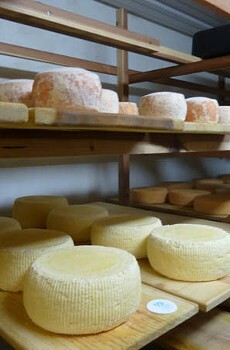 They make cow's milk cheese, but will offer sheep's milk cheese this summer. History: Cheesemaker Alissa Shethar learned to make cheese at Three SHepherds, and released her first cheese in 2011. She now makes cheese at Ramini Mozzarella's quasi cooperative. Most hard cheeses are made from raw Jersey cow milk from Taverna Dairy in Petaluma or raw sheep milk from Black Oaks Sheep Dairy in Sebastopol. Fresh cheeses are made from Straus Family Creamery milk. History: Cheesemaker Sheana Davis mentored under the late Ig Vella, former cheesemaker for Sonoma's Vella Cheese Co.
History: The Marin French Cheese Company has produced cheese in the same location in Petaluma since 1865. It began when the company produced fresh cheese for the San Francisco market. With the end of California's Gold Rush, disillusioned would-be miners poured back in to San Francisco, which in turn created a shortage of eggs. Marin Cheese French Co. sold its cheese as an egg substitute. The company was sold to Rians, a French cheese conglomerate, in 2011. History: Owner Karen Bianchi-Moreda's great-grandparents immigrated from Switzerland in the late 1890s and settled in Marin County. The other side of the family immigrated from Northern Italy. They bought the Jersey Dairy Ranch in Valley Ford. Interesting fact: Parts of the movie The Birds were filmed on the dairy. The scene in the movie where the guy's eyes are poked out was filmed in what was Bianci-Moreda's father's bedroom before that. Where available: San Francisco Ferry Plaza, Oliver's Market, Whole Foods (Mill Valley) and the Cheese Shop (Healdsburg). Restaurants include the French Laundry, Cyrus and Willie's Wine Bar. History: Rex and Barbara Backus moved from Los Angeles north to Napa Valley in 1972. They got tiny-eared La Mancha goats for grazing, milk and entertainment, and in 1992 became licensed cheesemakers. Interesting fact: Only cheese manufacturer in Napa County. History: Started in the late 1970s by Laura Chenel on a small Sebastopol farm. Its current home is the renovated Stornetta Dairy. Laura Chenel was sold in 2006 to Rian's Group, a French cheese corporation. Public tours: Yes. Email in advance for reservations. History: In 1978, Jennifer Lynn Bice assumed ownership of Redwood Hill Farm and Creamery, the family farm and a goat dairy her parents started in Sonoma County in 1968. Along with her late husband, Steven Schack, she expanded the business to produce a greater variety of goat's milk products and diversified the goat-breeding program. Public tours: Mini tours daily as time allows. The creamery store doubles as a viewing area of the cheesemaking operation. History: In 2005, Bonnie DeBernardi was given a few goats to keep her dairy cows company. With more milk than the family could drink, they began making hard, raw goat cheese in the style of the Swiss Alps. Public tours: Yes. Call ahead.